Win a drum head signed by the stars of Download! If you've been following our Download coverage you'll know that we spent the weekend hunting down the stars of rock and metal so you didn't have to. 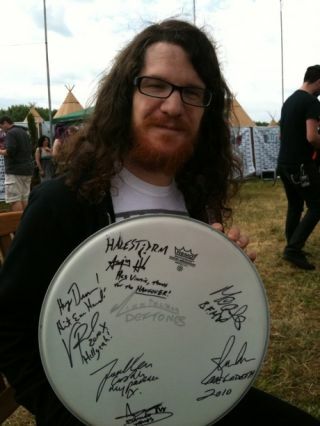 As well as a load of awesome drum interviews we also got a bunch of drummers to sign a drum head (as modeled by Andy Hurley from Fall Out Boy/ The Damned things, above), and you can win it right here (just like we promised on our Twitter)! Signatures on the head include Vinnie Paul, Gavin Harrison, Billy Rymer, Moose, Stix Zadinia, Andy Hurley, Abe Cunningham and many more (including Al Murray!). To win the head all you need to do is email rhythm@futurenet.com with 'Download Drum Head comp' in the subject line and we'll notify the winner by email next Monday 21 June. Simples!